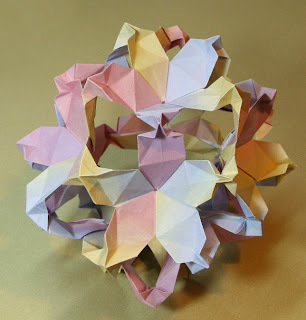 Here is another kusudama designed to be put together without glue. I almost achieved that goal. I resorted to a little glue on the last flower and its neighbour as the tension of the model at this stage of construction was a little too much for the joints. I also suspect that my folding had become a little sloppy by then. It was late at night and I had spent the entire day on the model. First came the idea. Next came several prototype foldings to see if the design worked out in practice. I made a couple of modifications as the result. I tried out several slightly different patterns and finally decided on one which was almost the same as the one I started with. Next I cut up some pretty paper and started the folding process. Twelve five-petaled flowers where every petal is shared by a neighboring flower means that I had to cut and fold 30 pieces of paper. I settled into a rhythm as I folded piece after piece. Nevertheless, it became tedious after the first dozen of them. I kept working because I wanted to see how it turned out. Some time after midnight I finished the last two pieces. Unfortunately the last flower fell apart when I tried to slot in the final petals. Tired out and disappointed, I abandoned it and went to bed. This morning I fiddled with the locks on the final flowers for a few minutues before deciding that the paper had lost its firmness and glue was required if I did not want to refold another five petals. Perhaps my readers will be more patient. Here is the crease pattern for the model. The angles at the base of each petal are 60 degree (hexagon) angles. There are number of internet sites which provide graphic instructions on how to find this angle. The hexagon angle works in this pentagonal flower because the flower is not flat. The pattern will work for a hexagonal flower as well which means it is suitable for kusadama patterns which use basketball design. The basketball polyhedron uses a mix of hexagons and pentagons.